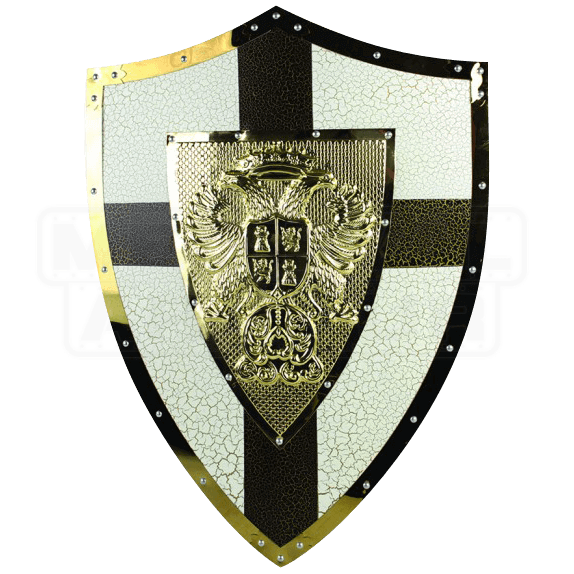 This impressive Holy Roman Empire Cross Shield features solid stainless steel construction with incredible detail. The face of the shield features a bronze-colored cross and there are little gold veins that provide an aged look. At the center of the cross is a large crest in gold. A heraldic eagle with two heads and a crown are displayed. Around the border of the shield is a golden metal trim with rivets to secure it in place. You can easily hang this shield in your home using the chain on the back. This shield is the perfect addition to medieval decor and a great way to show off in style at a medieval event.